Damon Young's 'What Doesn't Kill You Makes You Blacker' Is Powerful, Authentic Writer, critic and humorist Damon Young chronicles his efforts to endure the battles that come with being black; the beauty of his book is that he never tries to make it comfortable for his audience. For Damon Young — writer, critic, humorist, and the co-founder and editor-in -chief of VerySmartBrothas — being black in America is to "exist in a ceaseless state of absurdity; a perpetual surreality that twists and contorts and transmutates equilibrium and homeostasis the way an extended stay in space alters human DNA." Reading his work, one quickly understands black people perennially struggle to find a space to breathe without the pressure of institutionalized racism. In What Doesn't Kill You Makes You Blacker, Young chronicles his efforts to endure the plethora of battles that come with being black, including expectations about his fighting skills, the need to perform hypermasculinity, and the death of his mother at the hands of a healthcare system that treats African Americans as if they feel no pain. What Doesn't Kill You Makes You Blacker is a deconstruction of Young's various neuroses. Young has spent his entire life doubting himself, and the roots of that self-doubt can be found in the way black people are treated and the expectations placed on them by their status as others, as outsiders. In the 16 essays that make up the book, Young pulls readers into his world, showing them his vulnerability, hitting them with unflinching honesty about the state of race relations in this country, and keeping them glued to the pages with his wit and humor. While this is presented as a memoir in essays, What Doesn't Kill You Makes You Blacker is more of a personal collection of independent essays that offer a look at the life of one man. It is also a collection that serves as an authentic, keen, and touching example of the black male experience. Reading Young's essays is often an uncomfortable experience because he doesn't shy away from ugly truths. There is a lot of funny writing here, but also pain, insecurity, loss, and injustice. For example, Young believes his mother would be alive today if she were white because doctors never took her pain seriously, and he proves his point with historical facts. And just like his mother's cancer becomes a vehicle to discuss larger cultural issues, Young tackles one of the greatest cancers at the core of our country: racism. "White supremacy is so gargantuan and mundane that sometimes its existence and its proficiency can't be measured, addressed, or even seen without a stark change in perspective. It isn't like gravity. It is gravity. It is a ceaseless pressure intended to keep blackness ground-bound and sick." "If you're poor and black, America acts like you emerge from the womb twenty-seven years old, with four kids, five predicate felonies, and a lit Newport already between your lips. White people get to be babies. And they get to still be babies when they're adults. Poor black people are born Avon Barksdale." "While the experience of American blackness is too varied and motley to feign some sort of universality, none of us are immune to the random and haphazard violence of n****r; of being called one, of being treated like one, of being thought of as one. It, like n***a, also transcends status and station, as even n***as who believe they've somehow escaped and eclipsed n****r are susceptible to the n****r wake-up call, of having their blankets of perceived privilege yanked from underneath them, hurling them into space while n****r's savage gravity vaporizes them. It's through this collective fire that n***a is earned. We've earned the right to be it, to call each other it, to allow it to permeate our thoughts and our taunts, our minds and our music, our sentences and our souls." Vocabulary and racial slurs are only two of many spaces in which blackness and whiteness collide, with the latter usually embodying hegemony. There is a bit of that in every essay and that makes the book cohesive. 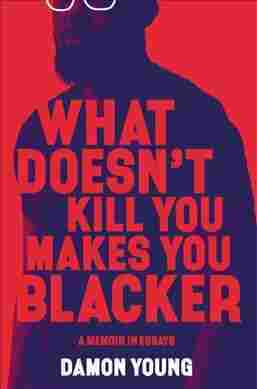 There are two somewhat meandering essays at the end of the book that could have used a stronger edit, but that aside, What Doesn't Kill You Makes You Blacker is an outstanding collection of nonfiction that encapsulates the black male experience — and demands change. Young is a talented writer and sharp cultural critic. He created something special with this timely and powerful book. It, like the work of bell hooks and Roxane Gay, should be required reading.